When did the Second World War end? 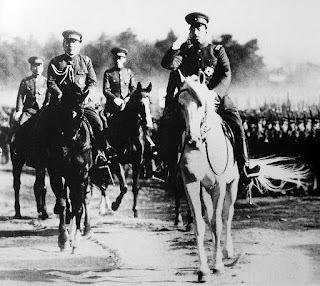 These are the dates on which Japan capitulated and then formally surrendered. 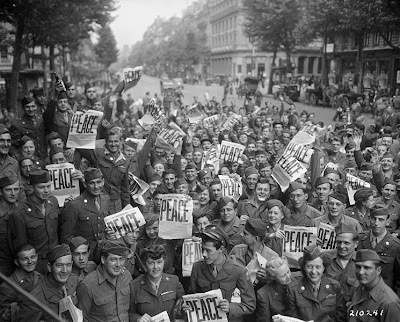 Consequently September 2nd1945 is commonly seen as the date which marks the official end of the war, yet it is a contested point for history is rarely so neat and tidy. It took time for word to filter through the decimated ranks of Japanese troops scattered across the far flung battle arenas in the Asia-Pacific region. In some places the soldiers continued to fight – either because they had not heard that hostilities were officially at an end, or because they did not believe that this information was true. It took time for these isolated areas to cease combat either through continued armed suppression or eventual surrender. 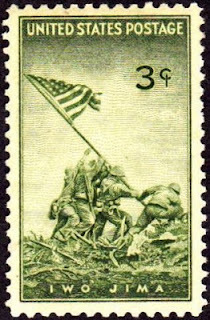 Some have argued though that the war never truly ended; or, if it did, they may even extend the date to other events decades later – for example, November 9th 1989, the fall of the Berlin Wall, or, December 25th 1991, when President Gorbachev resigned and the Soviet Union was dissolved – dates which effectively mark the end of the Cold War. Yet, whether we choose to set our historical chronometer by dint of plain facts – say, by the dates of certain treaties, or we choose to frame our chronicles according to more elaborate or nuanced perspectives, such as those favouring the longue duréeapproach, history is perhaps philosophically as much as historiographically speaking a matter of relative perception. There is a Japanese writer (Wakaichi Kōji) who maintains that the very last shot which was fired as part of the Second World War was a fatal one; and it occurred not in 1945 or in the years immediately after, but rather decades later – early in the morning of October 5th 1972. 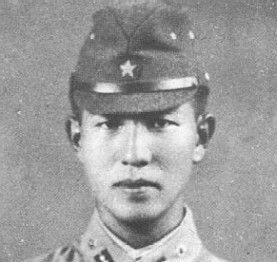 The soldier who died that morning was named Kozuka Kinshichi and he died on the island of Lubang in the Philippines. 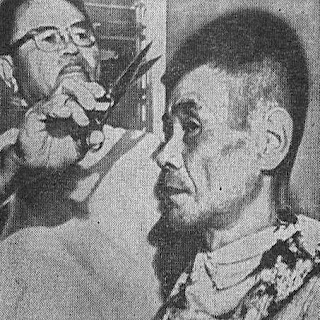 He and a fellow Japanese soldier had been startled whilst attempting to steal provisions from some Filipino farmers and subsequently Kozuka was fatally wounded in a shoot out with local Police. His companion managed to escape and by all accounts seemed to simply melt into thin air like a ghost. The two men were indeed like ghosts. Spectral apparitions left-over, haunting the island from an altogether wholly ‘other’ era – for the war they still seemed to be fighting had officiallyended nearly thirty years previously. At the time newspapers and TV media all around the world reported the story in equally fantastical terms. The perceived exoticism of lonely Japanese soldiers doggedly ‘holding out’ in the jungles of East Asia were fast becoming a standard trope. A stereotyped image of the stoical national character typical of the Japanese which has since set fast in the West as a cultural commonplace, an image which now seems almost impossible to override in the popular imagination. TV comedy shows have cashed in on laughs wrung out of this familiar-but-seemingly-fanciful idea (the reality for the islanders of Lubang however was far from laughable). There are even sporadic yet highly newsworthy occasions remarkably occurring right up until recent times where serious claims of newly discovered ‘hold outs’ are announced wherein the headlines proclaim that: “Japanese Officials are seeking to confirm recent claims that ...” (for example: in 1980, see here and here; and in 2005, see here, here, and here; plus 2006, see here and here). But these stories often miss the subtle nuance between the designation of a ‘straggler’ and a ‘hold out’ – which, in my opinion, signify two very different categories – though perhaps this is only natural (journalistically speaking), because there is far more exoticism and shock-value in one over the other. A ‘straggler’ is a defeated soldier who has missed repatriation at the end of hostilities for any of a variety of reasons, either by choice or by compulsion. He may fear death or punishment in his home country, or he may simply feel too ashamed to return; similarly he may not be permitted to return if he remains held in a POW camp, or is caught in another conflict zone (such as those interned in the Soviet gulag system, or those caught up in the civil war which resumed in China at the close of the Second World War); he may voluntarily or otherwise decide to join another army (for instance, the independence fighters in Indonesia or Vietnam). Many of the Japanese soldiers who were taken prisoner in North Korea and the Soviet Union are still to this day slowly filtering back to Japan (figures show that even as late as 1995 some 369 repatriates returned to Japan from China*). ‘Hold outs’, however, are stragglers of a wholly different kind. These are the men who refusedto surrender – either because the deep indoctrination of their upbringing or their military training meant that they believedit was their duty to resist and fight to the death rather than surrender, or that they distrusted the veracity of information claiming that the war had ended, viewing it suspiciously as enemy propaganda or simple subterfuge – and, consequently, in some cases (such as Lubang) they even continued to fight on; whilst others who in time came to accept the fact that Japan had indeed been defeated maintained their refusal to surrender because they genuinely feared they would be executed by ‘the enemy’ if they were caught, and so, consequently, they hid. These ‘stragglers’ and ‘hold outs’ continued to surface in the immediate post-war years and were subsequently returned to Japan well into the 1950s. The reactions they received at home were mixed and can be read over time as a barometer of national feeling as the Japanese nation as a whole sought to contend with the social realities of defeat and the subsequent and deliberate re-moulding of their collective consciousness which was socially engineered by the occupying US forces who supervised the restructuring of the nation and the re-writing of its constitution. The deep psychological shocks and traumas of the war period permeated the immediate post-war era in many different ways across the different levels of society. But as Japan began to rebuild and re-emerge as a changed, and eventually as a highly prosperous, modern nation these ghosts of the past still managed to resurface. The most remarkable of these ‘hold outs’ were undoubtedly the ‘final’ three, who also made the biggest impact in the media when they emerged in the early to mid-1970s. 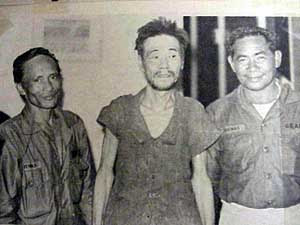 The first was Sergeant Yokoi Shoichi (1915-1997), who held out in Guam until he was discovered quite by chance in 1972. As with many of the ‘hold outs’ Yokoi had not been alone until the last few years before he finally emerged from hiding. He said he’d hidden out of fear for his life when Guam had been recaptured by the US Army in 1944. The Battle of Guam had been intense and the Japanese mostly fought to the death, such that there were relatively few prisoners taken. 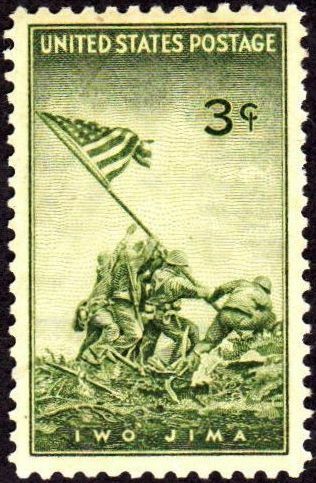 Dispersed groups of Japanese soldiers hid and continued to fight long after the island was deemed to have been secured by the American Forces. Yokoi was initially part of such a group. 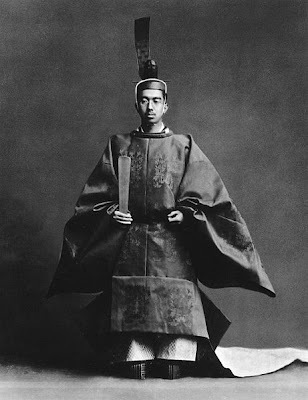 Later he said that he had come to realise that Japan had lost the war, but his fear of harsh reprisal from the local inhabitants (who had been brutally and viciously treated by the occupying Japanese Imperial Army) had been so strong that he thought it better to hide indefinitely. Although careful to hide all traces of his existence on the island, living alone in a tiny, cramped dug-out or self-made ‘cave’ and emerging mostly by night, he was eventually taken unawares by two local men, who, realising he was a Japanese soldier, captured him as humanely as they could manage. Yokoi was then hospitalised and treated for malnutrition. He was eventually repatriated to Japan – expressing his ‘deep shame’ that he had not succeeded in laying down his life for his country in the conflict. His homecoming was to turn him into a minor celebrity worldwide, but particularly in Japan – which after nearly three decades Yokoi found a totally transformed place. However, it seems the Japanese media chose to shy away from the unanswered questions which clearly remained surrounding public discussion of the wartime era, focussing instead on the more personal side of Yokoi’s story. His ‘weird’ (奇妙kimyō) otherness or the exoticism of his extreme survival skills, noting how in his profound isolation he had managed to weave his own clothes from bark fibre and whittling his own buttons, whilst contending with bugs and lizards, were a source of wonder and fascination. 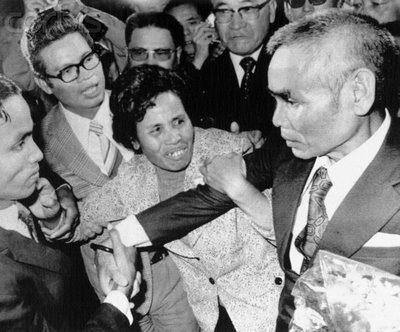 Yokoi was still a man of his time though – his request to meet the Emperor for whom he had fought, raised the awkward issue of Japan’s reconciliation with its past and was quietly passed over. As far as we know, Yokoi never officially met Emperor Hirohito. These awkward issues however would resurface far more pointedly after the incident in Lubang which resulted in the death of Private Kozuka Kinshichi (1922-1972). The unfortunate incident was confirmation, as had long been suspected, that Yokoi was not a singular oddity – there were in fact other Japanese soldiers still out there, unaware or unable to conceive that hostilities had given way to peace. It was now known beyond doubt that one soldier was still fighting on. 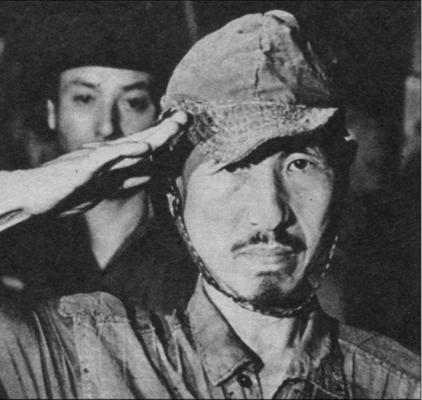 His name was known too – he was Second Lieutenant Onoda Hirō (1922-2014). His family and various other official search groups travelled to Lubang to try to ‘rescue’ Onoda – trying to contact him in order to persuade him to come out from hiding. But despite these efforts Onoda still managed to convince himself that these were again the advanced subterfuge tactics of the enemy, designed specifically to entrap him. He had been given orders never to surrender, nor to take his own life, but rather to continue his mission to the end, and he was determined to do this; hence his continued harassment of the local Filipino population – pilfering their provisions and stealing their supplies and livestock, setting fire to their fields in order to survive and ‘do the enemy harm’ whilst gathering ‘intelligence’ which would be useful once the Imperial Army returned. There still is, and was even then, some doubts as to what degree Onoda was actually convinced that the war was not over. It was later discovered that he had a transistor radio amongst his personal effects (and he had apparently heard of Yokoi’s ‘surrender’). Yet he had been trained as an intelligence officer at the elite Nakano Military Academy and it was noted at the time by some in the Press at home that his indoctrination had either run very deeply indeed, or, (somewhat sarcastically) that he was perhaps not a very intelligent intelligence officer if after so many decades he still hadn’t worked out for himself that the war was actually at an end. Either way he was eventually persuaded that the war was in fact over, and thereby he set out the terms under which he would finally give himself up. 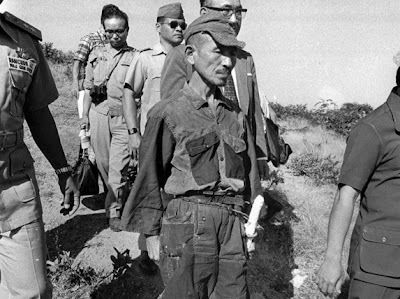 The unlikely events which lead up to Onoda’s highly publicised surrender in 1974 began with an equally unlikely encounter between Onoda and a Japanese student ‘drop out’ who had idly gone to look for him. The backpacking ‘drop out’ was a young man named Suzuki Norio (1949-1986), who had famously told his friends that he was setting out in search of adventure, hoping to find ‘a panda, a yeti, or Onoda.’ Consequently, it was not without a little trepidation that one morning, as he sat by his tent whilst camping solo on Lubang, he saw Onoda emerge from the undergrowth holding a rifle. When Suzuki told him that the war was over Onoda’s reply was reportedly: ‘It isn’t over for me.’ In the ensuing conversation Onoda stated that he was willing to surrender but only if he was officially relieved of his duty and told to stand down by his commanding officer. Suzuki later managed to convey this demand to the relevant authorities (Onoda having permitted Suzuki to photograph him as a way of demonstrating actual proof that their meeting had taken place), and amazingly enough the necessary arrangements were made. 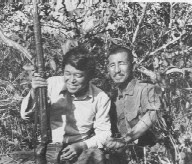 Onoda emerged from the jungle and was ordered to stand down by his former commander, Major Taniguchi Yoshimi (who since the end of the war had been living quietly as a bookseller in Tokyo). Much fanfare surrounded the theatrical ‘surrender’ of Lieutenant Onoda some thirty years after Japan’s defeat – a ragged and unshaven Onoda was even photographed publicly handing over his sword to Ferdinand Marcos, the then President of the Philippines (who also pardoned Onoda of various crimes and misdemeanours, not least of which was his participation in the deaths of around thirty individuals who came into contact with Onoda’s band of ‘hold-outs’ during those intervening years). Yet, remarkably, Onoda was not the last of these confirmed World War Two ‘hold outs’ to emerge, nor the last of which that prompted yet further awkward issues in Japan concerning its unresolved past. 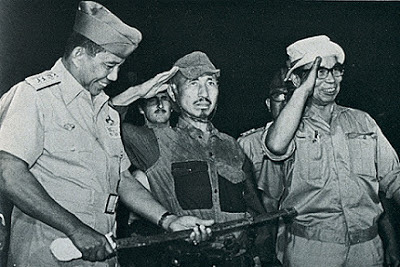 Later that same year a group of Indonesian soldiers, who had taken several days to reach their objective, surrounded a small hut deep in a remote and highly inaccessible region of the island of Morotai and gently began to sing the Japanese national anthem. 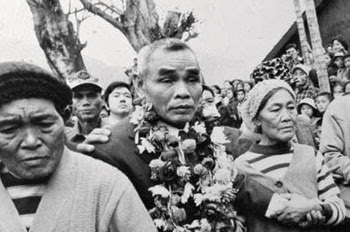 The naked man who emerged from the little hut froze to the spot – petrified – and thus apparently offered no resistance to his subsequent ‘arrest.’ He was Nakamura Teruo (1919-1979), a soldier in the Japanese Imperial Army but of ethnically aboriginal Taiwanese descent. Even more ‘a man out-of-time’ than either Yokoi or Onoda, Private Nakamura was a colonial subject from an Empire which no longer existed. Moreover, he had spent the last twenty years entirely alone. Initially he had difficulty answering the questions posed to him, or had difficulty articulating the concepts which informed his answers given his dislocated and temporally disjointed world view, particularly in light of the new realities which his military captors attempted to explain to him. He apparently thought of himself as Japanese and yet he (quite naturally) wished to return to his native Taiwan – he seemed unable to grasp the complications that this simple wish now entailed given the fact that his homeland was now administered by the Government of the Republic of China. 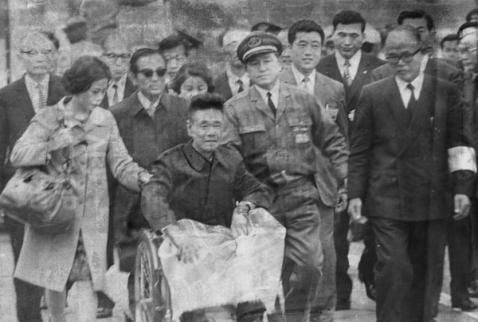 His repatriation proved even more problematic due to the political contretemps surrounding the very delicate issue that Japan was then in the process of shifting its formal diplomatic recognition from the Republic of China, led by Chiang Kai-Shek on Taiwan, to that of the Peoples’ Republic, led by Mao Tse-tung on the Chinese mainland. Eventually though Nakamura was repatriated directly to Taiwan, by-passing Japan altogether. The resurfacing of these ghosts of a formerly militaristic nation, like men stepping out of a time-machine almost, confronted by a world utterly transformed and a society they no longer recognised was a disconcerting and polarising experience for both parties. Overwhelmed and disorientated by the rampant materialism of modern day Japan the ‘hold outs’ seemed unfathomably odd and even quaint in the baffled gaze of a generation who had never known the war. Yokoi, Onoda, and Nakamura were admired for their self-reliance and their extreme survivalist skills. Yokoi’s fear of death or harsh reprisal compounded by his intense personal ‘shame’ at even being alive were at first rationalised, recasting him as a ‘victim’ of an impersonal and dehumanising system of intense indoctrination. Onoda however presented an altogether different and somewhat more complicated case; his intense and avowedly maintained militaristic demeanour was harder to explain away, and yet his stoicism and his exemplary attitude towards service and above all to duty were in some ways seen as admirable (much was made of the fact that when he surrendered Onoda’s rifle was still in pristine working order and he still had a cache of live ammunition). 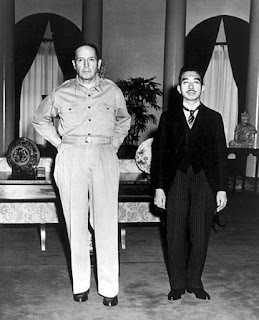 Yet Nakamura’s outright rejection of the invitation which resulted from an intense popular up swelling of calls for him to be allowed to settle in Japan arguably reawakened old and unresolved issues concerning post-colonial guilt (which arguably helped to push Japan to officially redress the issue of more appropriate compensation for non-Japanese veterans who had served in the Imperial Army as late as the 1990s). Certainly questions continued to bubble away as to the extent to which the Japanese Government was guilty of wilful negligence in mounting proper searches for ‘stragglers’ and ‘hold outs’ as well as returning the remains of fallen soldiers from the battlefields of the Asia-Pacific region. To what extent could the general population be exonerated of guilt if blame was placed entirely on the Japanese military when ordinary members of the population had served in that very same military? The resulting ambiguity of being both guilty and innocent on the personal level was arguably just as hard to reconcile collectively. And to what extent can the phenomenon of the ‘straggler’ or ‘hold out’ be viewed as a peculiarly Japanese one? 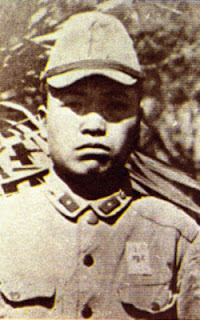 Certainly stragglers of other nationalities were known – there is even the example of Liu Lianren, a Chinese national who was forcibly taken from Shandong in China and transported to Hokkaido (northern Japan) in 1944, who was forced to work in a mine but who managed to escape before the end of the war and continued to survive in the mountains for thirteen years unaware of the end of the conflict. When he was discovered in 1958 the Japanese government were highly suspicious of his story due to Cold War tensions, but he was later repatriated to China and the question of his compensation rumbles on and still awaits a final settlement to this day (see here, here, and here). It’s also arguable that the trope of the Japanese ‘hold out’ – a kind of latter day exotic ‘orientalism’ perhaps – which has become somewhat fixed in the popular culture of the West in part fed into the continuing US national fixation with its own M.I.A.s (“Missing in Action”) and the widespread belief in, and the search for, missing military personnel left in Viet Cong prison camps at the close of the Vietnam War (a conflict which was contemporary with the emergence of Yokoi, Onoda, and Nakamura) – and stories of which continue to surface to this day (see here and here). For those people who actually fought in the war the date of its actual end is likely to have been much more personal, and could perhaps even be graded on an individually unique scale, for instance: of the eventual cessation of combat at the site where they fought; of their discharge from service or de-mobilisation; of their return to their home country; or their return to their actual family home – or perhaps even the day their medals arrived. Some may even go so far as to say a war is not over until the last soldier who partook has peacefully passed away in old age, or even when the last person with a living memory of those events has finally passed. All are perhaps equally relevant terminal points in the continuum of such a momentous event in world history. Whether taken together as a whole or looked at in isolation, these different end points define what continues as the sum total of collective and individual social memory. 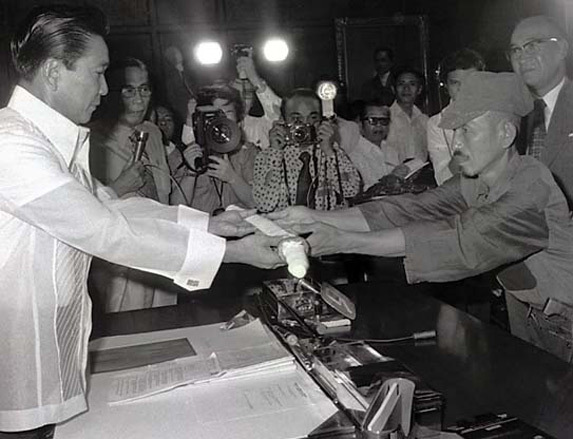 There is little doubt that issues concerning the reconciliation of the Japanese state to its role in the Asia-Pacific region during its period of colonial expansion and the Second World War continue to taint or inform current foreign policy and regional news agendas, particularly in Japan’s relations with its near neighbours, Russia, Korea, and China, in the form of diplomatic and territorial disputes, or the controversial visits of Japanese Prime Ministers to the Yasukuni Shrine in Tokyo which enshrines the nation’s war dead. But this does not make them unique. The respective nations of the Europe from time to time are also reminded of the bitterness of a violent and adversarial shared past. The European Union was instituted in order to unite and so help allay the repetition of such animosities as much as to promote trade and mutual economic benefits, even though such deep divisions definitely do persist beneath the surface. Our modern world of nation states may well have been forged out of the era of colonial expansion which arguably brought about the two cataclysmic conflicts of the first half of the 20th century, but the collective and enduring legacy of those wars continues to affect us all on a personal level. Questions of nationality and social rank feed into our notions of identity and serve to place us into context – how we remember either connects or disconnects us to the questions raised by our shared past in ways both seen and unseen. This is why history matters. 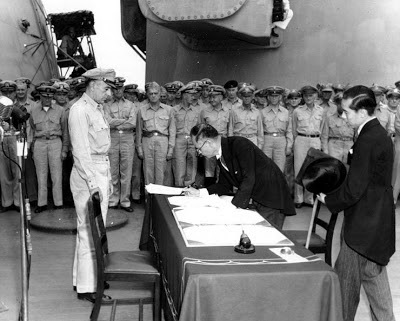 Why the signing of a treaty is just as important an end point as the day our grandfather received his medals (or perhaps didn’t as the case may be). Reconciliation is the key to a better future – reconciling the personal and the collective legacies of war, reconciling the victors with the defeated, and the defeated with the victors, is something which historiography can help inform and open up. Better that we discuss and describe in textbooks openly and honestly rather than seek to conceal or shy away from the past for the sake of pain or politics, or out of fear, shame, regret, or anger. Differences matter, but they should not be allowed to divide us. Acknowledging our differences and our diversities whilst working together as one is surely the best of all solutions. If we can actually claim to say that wars do eventually come to an end, it is certainly true that their influences continue to be felt long after the last bullet has been fired and even after the last soldier has surrendered his sword. But this does not mean we should forget, or, perhaps worse still, cease to examine the history which has made our world what it is today. 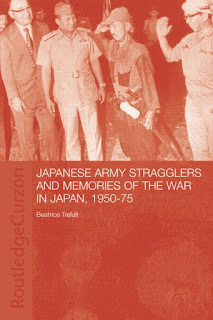 For a full and excellent scholarly examination of Japan and its Imperial Army stragglers, see: Japanese Army Stragglers and Memories of the War in Japan, 1950-1975 by Beatrice Trefalt (Routledge Curzon, London & New York: 2003). Yokoi Shoichiand Onoda Hirō have both written memoirs which have recently been translated and published in English. An Australian TV interview film about Onoda Hirō, plus a film & a BBC World Service radio programme about Yokoi Shoichi on Guam. All of the photos illustrating this article are confirmed as being in the public domain, or are assumed to be in the public domain given the age of the events they depict and their general prevalence on the world wide web; wherever possible I have sought to ascertain and credit their original provenance with the relevant links embedded and as such any infringements of rights therein or consequent to their assumed fair use in this article is wholly unintended. The colour photographs accompanying this piece were taken by me personally during my own trip to Guam in 2009. Many remarkable images and videos of WW2 military wreckage and ruins in the Pacific region can be found across the web, but these are a couple of very good examples: here, here, and here.